From Goodreads: From the outside, Coley Sterling’s life seems pretty normal . . . whatever that means. It’s not perfect—her best friend is seriously mad at her and her dance team captains keep giving her a hard time—but Coley’s adorable, sweet crush Reece helps distract her. Plus, she has a great family to fall back on—with a mom and stepdad who would stop at nothing to keep her siblings and her happy. But Coley has a lot of secrets. She won’t admit—not even to herself—that her almost-perfect life is her own carefully-crafted facade That for years she’s been burying the shame and guilt over a relationship that crossed the line. Now that Coley has the chance at her first real boyfriend, a decade’s worth of lies are on the verge of unraveling. In this unforgettable powerhouse of a novel, Mindi Scott offers an absorbing, layered glimpse into the life of an every girl living a nightmare that no one would suspect. Coley is leading a double life. From the outside, things appear pretty great, but behind closed doors her world tragic, fraying at the seams. She’s very good at compartmentalizing, tricking herself into a normal frame of mind, and excusing away the absolutely unacceptable behavior of a family member. She lies often and to everyone — not something I normally tolerate in a narrator — but Coley’s lies are a survival mechanism, plain and simple. Instead of turning me against her, they helped me sympathize with her. And aside from sympathizing with Coley, I also just really liked her. She’s a smart girl, a caring girl, and real girl, someone I would have wanted to hang out with in high school. Coley’s got a few great friends and she’s on the dance team, but the brightest spot in her life is Reece, a sweet band sort-of geek. Coley’s relationship with Reece plays out slowly and realistically, and I found myself wanting to hug him more than once. He’s thoughtful and funny and patient, romantic without being cheesy. He’s what high school boys should aspire to be. Despite Coley’s likability and Reece’s charm, Live Through This is a rough read. It left me raw and sad and confused, much like Coley feels throughout the course of novel. That was okay, though, because this is a dark, serious book, an important book, one that might be capable of helping people who think they’re alone in the world feel a little less so.The subject matter is heavy. It’s dealt with in an unflinching manner that, while appropriate for this kind of “issue book,” sometimes made me uncomfortable. Mindi Scott’s clean, capable prose and Coley’s believable character arc kept me reading, though, as did the many adorable moments Coley shared with Reece. 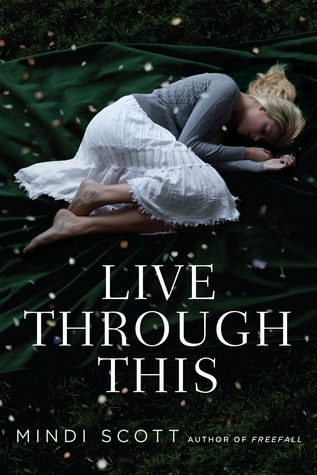 One last note: I’ve read a few reviews that expressed displeasure with Live Through This‘s abrupt ending, but I think it works. Coley’s problems aren’t the sort that can be wrapped up neatly with a few hugs and an apologetic conversation. Mindi Scott gives her protagonist resolution, but not necessarily closure, and I found that courageous. I imagine Coley’s got a tough road ahead and to conclude this novel with a happily-ever-after would have, in my opinion, been inauthentic. I applaud Mindi Scott for writing Live Through This, especially since (according to this letter) she has personal experience with the subject matter. And I thank Stephanie Perkins (who said: “Live Through This is by turns harrowing, sad, funny, and romantic. I couldn’t put it down.”) for sharing an ARC with me. And if you’re looking for another writer’s thoughts on this story, check out my friend Christa Desir’s post on culpability and the beauty that is Live Through This. Don’t forget to check out Jessica Love’s recommendation of Time Between Us! Tell Me: What’s the best “issue book” you’ve read recently? I am looking forward to reading this book and am excited because I have a signed copy coming. It’ll be interesting to see how I feel about the ending. Usually I like things wrapped up in HEA, but it doesn’t sound like this one is so easy. It’d be a challenge for me to write an ending like that, but one I’d like to attempt someday. Ooh, enjoy your signed copy… I’m jealous! You’ll have to let me know what you think of the ending. I’m partial to the HEA too, usually, but the more open-ended conclusion to this novel really works. Can’t wait to get my hands on this as I loved Freefall. To answer your question, the best issue book I’ve read this year has been Louisa Reid’s Black Heart Blue. Visceral, stunning, bleak – I could barely turn the pages fast enough. Thanks for this thoughtful and honest review. This sounds like a really important and powerful book, and I’ve heard wonderful things about the writing. I hope you get a chance to check it out, Rebecca. I found it very moving. Thanks for sharing your thoughts on this, Katy. This book sounds really good. Tough to read, but good. Will have to make sure it’s on my TBR list. I hope you have a chance to read it, Jaime. It’s definitely not a “fun” book, but it’s beautifully written and quite powerful. This book sounds amazing. Thank you for sharing it with me. I hope you’ll give it a read, Liz. It’s incredibly well done. Hadn’t heard of this one. I’ll have to check it out. I hope you do… You’ll have to let me know what you think, Kirsten! I really loved FREEFALL, so I am anxious to check this one out. I definitely need to read this! What a great review! Thanks, Tameka! I hope you track down LIVE THROUGH THIS and enjoy it! I LOVED Freefall and your review DEFINTELY makes me want to read this! Most powerful issue book I read lately – HATE LIST. Still thinking about that one. Aah! I’ve been wanting to read HATE LIST forever. Now I’ll definitely have to track it down. Thanks, lady!